Held every February, the Tokyo Marathon has joined the ranks of the Berlin Marathon and the Boston Marathon as one of the World Marathon Majors. Having just begun in 2007, now less than 10 percent of applicants are able to participate, selected by lottery. Here I'd like to share a few photos taken while I ran the 10th anniversary marathon in 2016. The meetup point is in front of the Tokyo Metropolitan Governmental Building, with runners arriving at Shinjuku Station early in the morning to get there on time. Staff are on-hand at the station to point runners in the right direction. 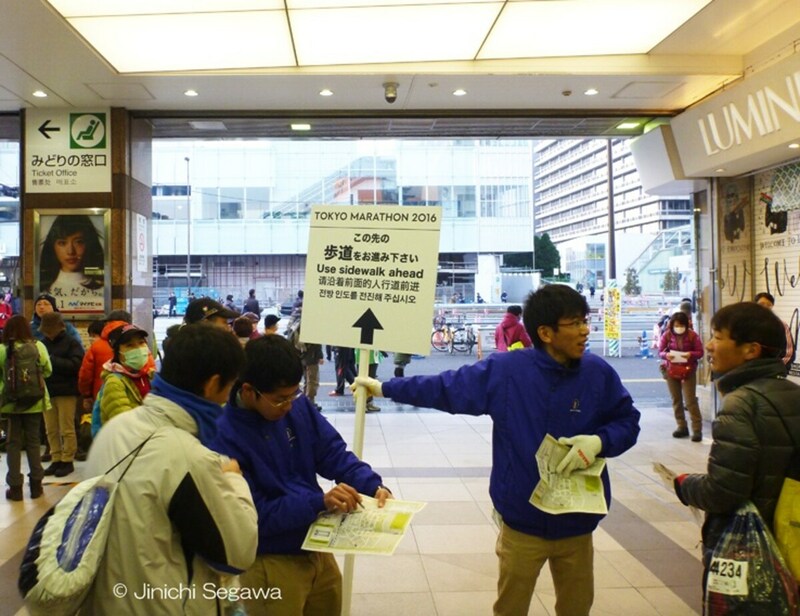 Runners outside the Tokyo Metropolitan Government Building are ready and waiting for the race to begin. In the cold February air, some wear windbreakers and jackets they'll remove once they start to run. Whether excited or anxious, everyone's hearts are pumping before the race. Chatting with other runners and taking commemorative photos like this one help us to relax. I reach the starting point at last. With organizers and well-wishers looking on, the full marathon begins! As we run down this street in Shinjuku, my body is still far from warming up. It's not uncommon to see runners wearing character outfits, or kigurumi. Here I've spotted someone dressed up as Mount Fuji. It's important to drink lots of water, so I'm sure to stop by the hydration station, where the staff cheer me on. Police officers and doctors run alongside the participants in case of emergency, ensuring a safe run for everyone. We pass in front of the Kabukiza theater in Ginza. Is that a kabuki actor cheering us on?! Tomatoes for lunch. They soothe the throat and are even said to help you recover from fatigue. My legs have started to ache as we reach the first turnaround point in Shinagawa. It seems a lot of people are starting to show signs of muscle pain. We just have to push on. After passing Kaminarimon in Asakusa, Tokyo Skytree stands in plain view in front of us. 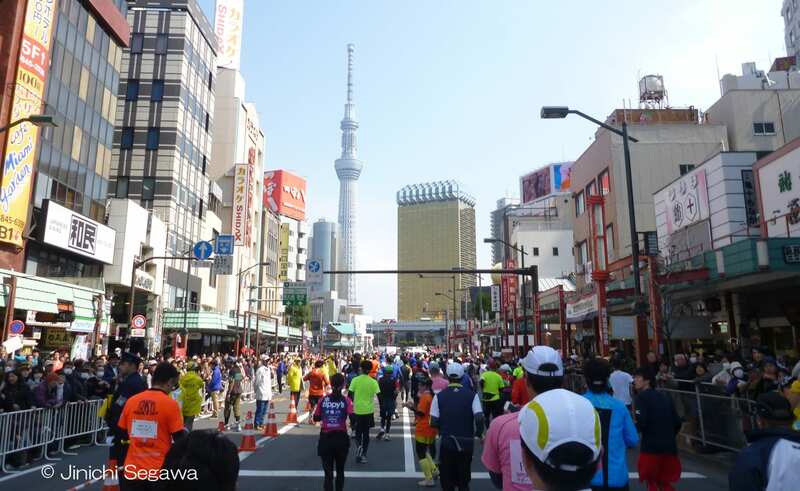 Since the course also passes by Tokyo Tower, we're able to enjoy views of both of Tokyo's landmark towers as we run. It's been a long and difficult road, but we've finally reached the 1 kilometer (0.6 mi) mark. Everyone is completely exhausted, but it's just one last spurt to the finish line. The long-awaited goal! The runners' faces are a mixture of relief and exhaustion. While the 2016 marathon ended in Odaiba, expect to see a different ending scene in 2017, when the finish line will be moved to Tokyo Station. Here we receive our participation medals. Having that medal placed around my neck is when it really sinks in that I've completed a full marathon. Despite all the times I felt exhausted, the cheers of the people around me really kept me going. The Tokyo Marathon is fun!